A painful plant that can bring pleasure to your skin. The stinging nettle (Urtica dioica) grows commonly in Europe and North America. You can find them alongside rivers and trails where the soil is moist and rich. When alive, their leaves and stems can sting your skin, yet over the centuries they’re still known to have many medical benefits. The sting you experience happens when you touch their leaves or stems. Tiny hairs on the plant release a harmful mixture of chemicals, such as acids and histamines, causing your skin to inflame, break into a rash, and create other allergic reactions. These reactions may vary, but can be very painful. The good news is once you boil or dry out the plant, the tiny hairs lose their harm. They become completely safe and even beneficial when used in cooking and home remedies. The nettle itself is rich in nutrients including vitamins A, D, and K along with calcium, chlorophyll, iron, magnesium, potassium, and silica. This wide variety of nutrients is what makes this plant so valuable in a wide variety of ways. The silica content is especially high and promotes strong hair, nails, and skin. It works amazingly as an ingredient in many shampoos and other hair care products. Traditionally, dried nettle is made into a tea. When consumed, the magnesium in the tea helps reduce cramping. The tea also works as a diuretic clearing toxins from the body and helping the liver and kidneys to function. When these organs work more efficiently, your entire body works more efficiently and your skin becomes more radiant with fewer breakouts and blemishes. Another way to enjoy the benefits of this plant is to take advantage of its inflammatory chemicals. When the plant is dried and consumed or made into a lotion, the plants own inflammatory chemicals help soothe inflammation for you. A study has even proved, by taking nettle capsules during hay fever season, you can potentially reduce your allergic reactions such as itchy, puffy eyes. It may even inhibit the same enzymes and neural pathways that cause acne and eczema. So if you own a pair of gardening gloves, consider throwing them on and tackling this plant. If not, you can easily find nettle tea bags, nettle extract, and other products readily available with a quick internet search. 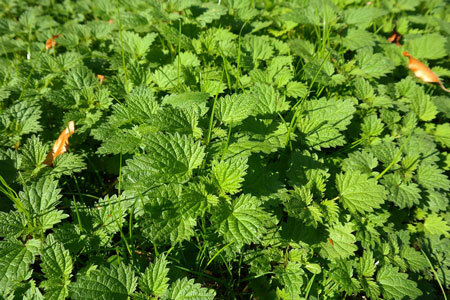 Try out stinging nettle for a couple weeks and see just how wonderful this troublesome plant can be. What’s So Great About Flaxseed? European Skin Care. All Rights Reserved.